For 50 years, Moore's Law has paved the way for faster, smaller and cheaper devices. The observation focuses on the economics and scaling of silicon chips, which are at the heart of computing devices. Loosely translated, predictions in Moore's Law mean that every 18 to 24 months, you can buy a faster computer with the same amount of money. Moore's Law predicted that the number of transistors in a given die area would double every two years, and that making chips would get progressively cheaper. But a debate is raging around just how long Moore's Law will last. On the 50th anniversary of Moore's Law, IDG News Service asked top industry analysts to share their opinions on where the famous observation is headed, and how long it will remain relevant. "The most important direction that Moore's Law sends the world in is not more transistors-per-chip. It's what those transistors enable people to do that sets the direction. Chips are blank canvases for designers to create products that delight us, allow us to create, communicate, and most important of all ... extend the power of our brains so we create things like the latest drugs. It has also created US$13 trillion dollars in economic value, an amount that's equal to a third of the U.S. economy. Moore's Law saved 33-gigawatts of power [last year]. "As for how long Moore's Law will last, no one knows. Even in [Gordon Moore's] first paper, he would only speculate 10 years out. At 50, we still have the same visibility: 10 years. Gordon asked Stephen Hawking what he the thought the limit was. Hawking said the ultimate limit was the speed of light and the size of a single atom. So, we have a long ways to go." "Moore's Law has a few years of life left to it. Over time we will likely see the decline in per-transistor cost of chips slow, and perhaps even stop. We will still see complex processors and higher transistor counts, but they will come with a higher price, where before they were free or had even lower cost. "When Moore's Law inevitably comes to a close, what we will see is probably going to look an awful lot like what is happening today: the most expensive transistors will go to places where they are most economically effective, which is into servers, while cheaper and fewer transistors go to lower-end client computing devices like phones and tablets. Rest assured that even when Moore's Law is over, growth in computing performance is limited only by the willingness of customers to pay for more speed." 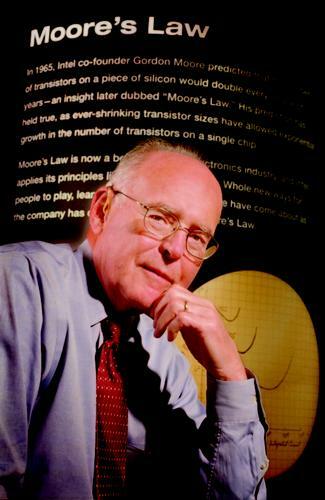 "Moore's Law will continue to improve for at least five years and probably a decade. The industry has done tremendous work researching new technologies such as silicon photonics, 3D integration, tunneling FETs, and graphene to ensure that there will be options for us in the future. The crucial challenge is discovering how these billions of transistors will add value -- especially since energy efficiency is a limiting factor for most computing applications, from the Internet of Things to smartphones and servers. "The industry cannot rely on manufacturing to increase performance, power efficiency, and cost simultaneously. Circuit design, system architecture, and software will become crucial. Techniques like quantum computing will never become general purpose, but are orders of magnitude more efficient for certain problems. Finding the correct answers will require increasing technical specialization, but also a cross-discipline understanding of how to deliver value to the world around us." "Moore's Law is a self-fulfilling prophecy: Every year the semiconductor industry invests tens of billions of dollars into R&D to continue future [manufacturing] process shrinks. Big, complex chip designs rely on the bleeding edge of process technology to bring greater capabilities in the most demanding applications. In the client markets of PCs, tablets, and smartphones, we are entering the era of good-enough computing. "What's still driving client computing forward is the demand for higher resolution displays, longer battery life, and device thinness. What this all means is that the drivers of Moore's Law are fracturing -- microcontrollers and sensors will jump off to save costs, big chips will become increasingly pricier to make, and client computing will drive massive power reductions to make capable, but incredibly thin, personal devices. The role of Moore's Law is to keep driving the industry forward, no matter how it's done, nor the costs -- and for that, I see a long life for it ahead as symbolic driver." "We've seen a half-dozen or so other technology tricks being leveraged in driving down cost, increasing performance, or adding functionality in smaller spaces. Advancements today are coming from multi-chip assemblies, wafer-level packaging, and other non-Moore's Law aspects that go beyond smaller feature sizes that drove advancements in the integrated-circuit industry during the 1970s to the last decade. Some have called it 'more than Moore' technology. "Moore's Law is more important to some types of integrated circuits than others, such as microprocessors and memories versus system-on-chips and sensors. More of the semiconductor industry is diverging -- splitting apart, with some of it moving further away from Moore's Law -- while other parts continue to need the steady drum beat of device shrinks, like 64-bit application processors in cellphones."